We’ve had many requests for more frequent, less thorough updates, so here goes -> The parts that we said were stuck in customs have remained stuck in customs, despite the shipper telling us they would be released “this week” every week for over six weeks straight. We ended up repurchasing the same batch of parts and shipping them into China in smaller packages, which thankfully got through customs. The PCBA (printed circuit board assembly) fabricator now has all components and has commenced making our long awaited next batch of boards. The first shipment is due to arrive on Monday and the vendor has committed to delivering all boards by 12/8. 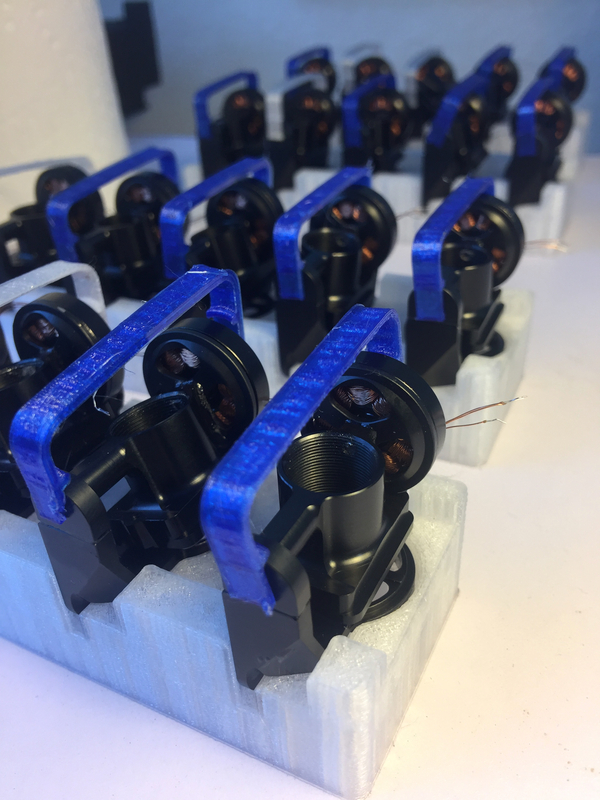 We have been busy building all supporting sub-assemblies, including complete rotor sets and batteries, and have large quantities waiting and ready to go, so we expect to be able to pump units out once the boards arrive, assuming there are no unexpected quality issues. We also thought you might enjoy seeing the results of another test with our Wi-Fi repeater. Note the range (in meters) in the lower right. We’ll fill you in on all of the exciting communications updates next time we have a moment to breath. We continue to ship Snaps at an accelerating rate, although we have not been able to do so as quickly as we hoped. Supplier delays and yield issues with PCBAs (printed circuit board assemblies) have been the primary reason for missing our targets. Additionally, a batch of components was unexpectedly held in customs for nearly a month and a key PCB supplier had a fire, both of which further added to PCBA delays. 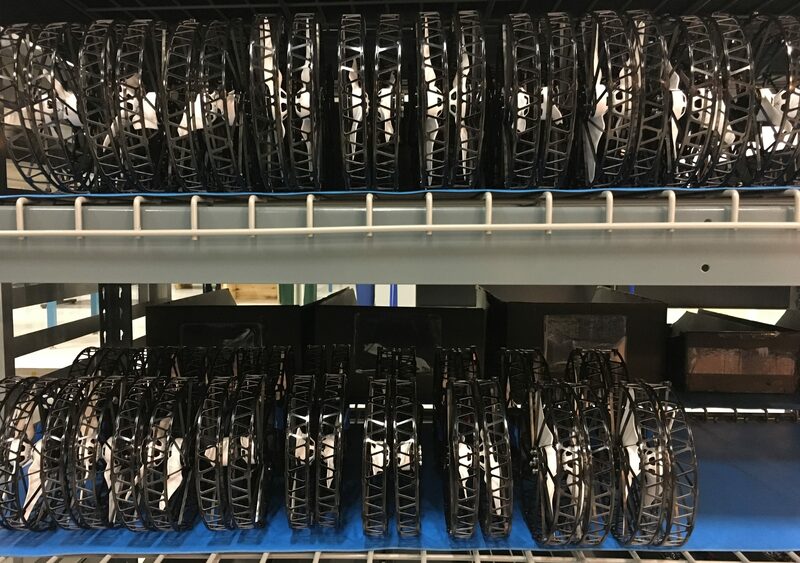 Because we have just been short on a subset of components, the assembly team has been building large numbers of subassemblies with available components as we await the next PCBA delivery. This will let us move considerably faster once the delayed PCBAs arrive. Our expectation at this point is that we will have most of the units shipped by the end of November and the balance complete by the end of December. The Wi-Fi board and the magnetometer on the tail board have had our two primary sources of yield problems. We had less than 50% yield in PCBA fab (the step when components are soldered onto PCBs) and additional units failed during our quality control test process. As one would expect, this has significantly reduced our shipping rates. These two issues have been especially thorny, in that we had a few units which made it through our test process and then failed either during shipping or in customer’s hands – not good! We’ve been working with our component suppliers and PCBA fabrication partners to fix the root issues, have updated our burn in process to be even more stringent to make sure to catch borderline units, have updated our pre-flight automated check procedure to ensure we identify these issues before takeoff, and refined our sensor failover algorithms to make sure handle any failures in flight safely. We have been shipping units internationally to all countries for over a month. 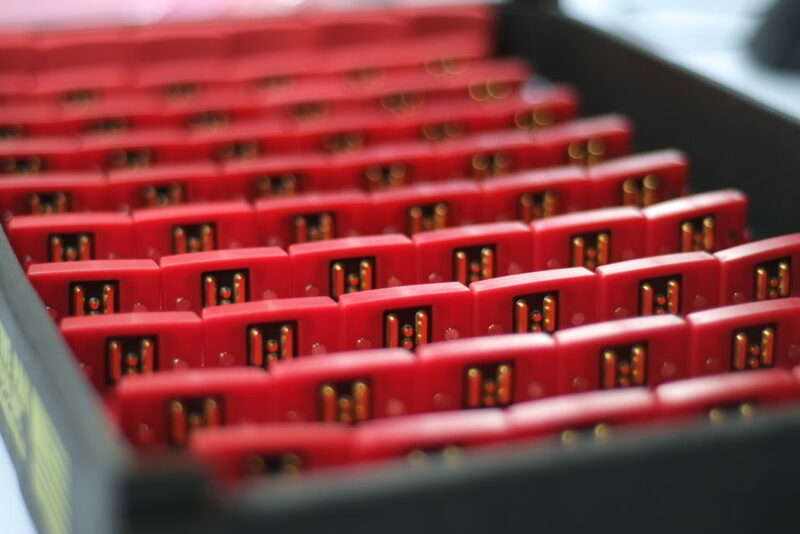 We’ve also been picking up speed with battery production and plan to start shipping spare batteries to customers in the next few weeks. We have been shipping a fuselage sleeve in lieu of a case, which is frankly our preferred solution, having used both the case prototypes and the sleeve for many months, as the sleeve is lighter and fastest to deploy. That said, we haven’t forgotten about the case, but have been prioritizing getting everyone units as quickly as possible first. We don’t expect to ship cases until the beginning of next year. 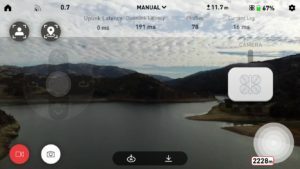 For the DSM controller fans out there, we have a unit flying now with DSM and are working on making this integration ready for you. While we know bluetooth game controllers don’t quite have the same feel as DSM controllers, we still find it to be rare for us to want a two stick controller at all, and rarer still that a bluetooth game controller doesn’t meet our needs when we want two stick control. But again, for those of you who want this, we know we promised it at the outset, so we’ll certainly be following through and delivering. We also have prototype Wi-Fi range extenders working well, which are a nice option for anyone to go really big on their manual control shots. One can use off the shelf Wi-Fi repeaters, so we’ll share instructions for implementing your own repeater for anyone who is eager and follow up with a dedicated solution. The software team has also been hard at work on many fronts. Our Android app is now available on the Google Play store and being used by many customers. It still doesn’t yet have the same scope of features as the iOS app, but we’re continually adding more capabilities to get it caught up. We’ve had a major communications software update in the works for over seven months now that we expect to be making an announcement on very soon. We’ll also be following up this update with a number of announcements on new tracking modes, improved tracking accuracy, and new flight modes. All my friends and family that I have been sharing the videos I am taking are amazed at what Snap can do… Rest assured, you guys are making an amazing product! It is ridiculously easy to fly & is very smooth. I might be putting my Spark up for sale shortly as the Snap keeps impressing me the more time I can spend with it! Trust me I am seriously blown away with it!!!!! For everyone waiting to get your unit, it kills us to stretch your patience as we have. We are dedicated to shipping a quality product and doing so has been about 10 times harder than we ever expected, at every step of the way. We will continue to push our suppliers, burn the midnight oil, and expand our feature set until every one of our customers has their Snap and gets to experience the amazing thrill of aerial video made easy. Until then, we thank you as always for your ongoing support, words of encouragement, and for joining us on this ride. We are delighted to announce CNN received a landmark waiver from the FAA for commercial drone operations over people using Snap. We’re honored to have worked with CNN and the FAA in achieving this milestone. This is the inside scoop on how this came to be, and what we think this development means for Vantage, our customers, and the future of flying cameras. First, a bit of background. At Vantage, our goal has been to make extraordinary aerial video easy. We saw that this required a safe drone that didn’t compromise performance for multiple reasons. First, all the video we liked had people in them, and we didn’t want to cut anyone. Moreover, even after decades of using two stick controllers, we saw that five degrees of freedom (forward/back, side to side, up/down, rotation, camera pitch) were too much to control simultaneously for the purposes of creating beautiful video. This is demonstrated by the standard for both military and commercial drones to have two operators, one for the aircraft and one for the sensor. The obvious solution is to let software take over, but this is easier said than done. When you are creating new interfaces, with advanced sensors and nascent software for controlling them, things are going to go wrong. And there are serious consequences if a conventional drone with unprotected rotors hits someone. This was part of what led us to develop a safer flying camera, so we could innovate on ease of use without having the tension of putting people at risk by doing so. 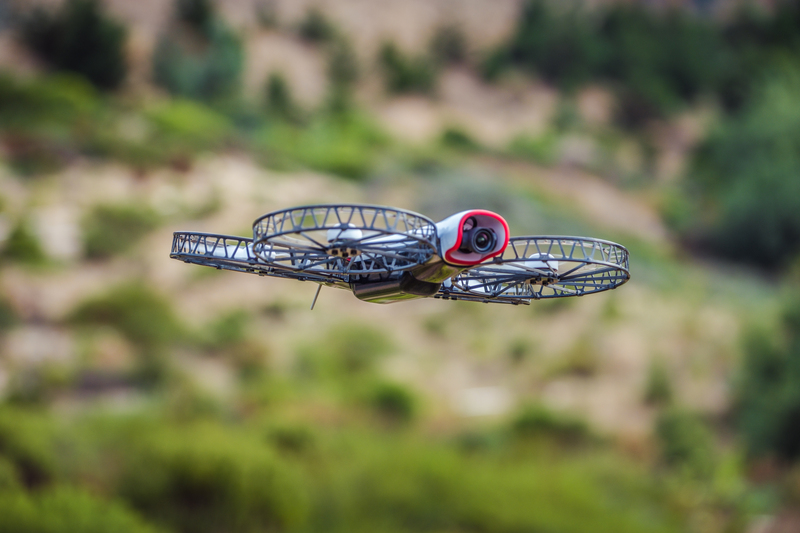 Making a flying camera safe without compromising performance was hard. 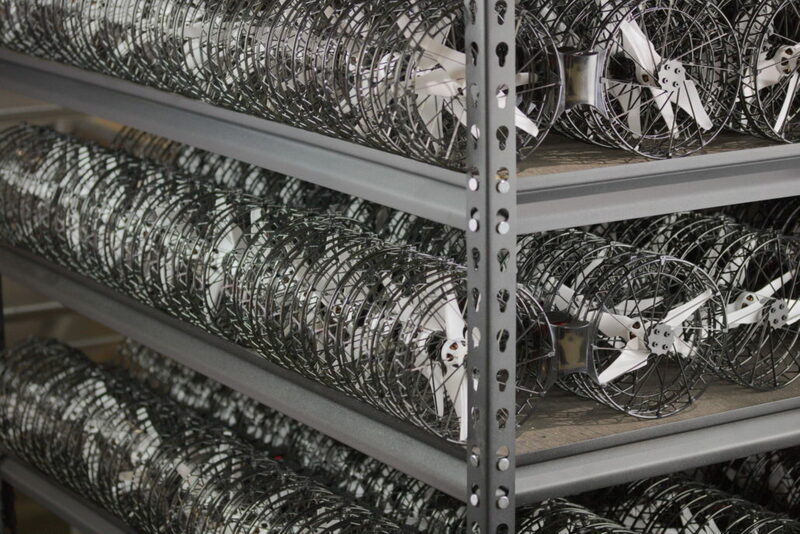 Prop guards created issues with portability, durability, wind performance, flight time, and video quality. Additionally, props weren’t the only risk from drones – the sheer mass of a conventional drone falling on one’s head creates risks for concussion, neck injury, contusions, and lacerations. It took several years to address these challenges. We created a radically small gimbal to minimize the payload weight (creating our own custom camera to support this was a terrifying endeavor as a small startup). We used exotic materials and all the design tricks we could muster over hundreds of iterations to create a prop guard that protected against cuts without compromising flight time or wind performance. But we found this still wasn’t enough, as the prop guards made the product too hard to carry with reasonable blade sizes and they broke too easily in crashes. A magnetic snap together architecture, which let the prop guards and battery break away on impact addressed this, although it took a few more years to work through all of new issues created by this architecture. And even with these improvements, we found that the total energy available at terminal velocity still created a risk, so took advantage of an approach used by larger helicopters, and enabled Snap to autorotate on “uncontrolled descents”, which reduced the descent rate significantly. The safety analysis also forced us to look closely at reliability and possible points of failure. As a result, we now have triple redundancy on attitude and altitude estimation, double redundancy on heading estimation, and more rigorous checks for identifying bad sensors in advance of take-off. We also have triple redundancy on our battery connection and have are developing techniques for controlled landings in the event of a single motor failure. It was gratifying to be able to fully quantify the benefits of all of the different design elements for improving safety. We showed that a small amount of Snap’s kinetic energy is transferred to a target on impact, thanks to the deformable and frangible design. We also got clear results indicating that our smooth surfaces dramatically reduced peak pressures and specific impact energies, which were the metrics used to quantify risk. In a drop test onto ballistic gel, Snap was the only drone tested that did not leave any damage to the gel. The FAA ultimately granted CNN a waiver to operate Snap over people at up to 150 feet above the ground. So what does this mean for our community of individual pilots? First let us cover what it doesn’t mean. The waiver is not a free pass to use Snap irresponsibly – it still has the potential to do hurt people when used recklessly. Part of the basis for this waiver is CNN’s stellar track record as careful and professional drone operators. Please don’t ever intentionally fly Snap into anyone or fly high directly over anyone (especially bystanders – that’s lame). 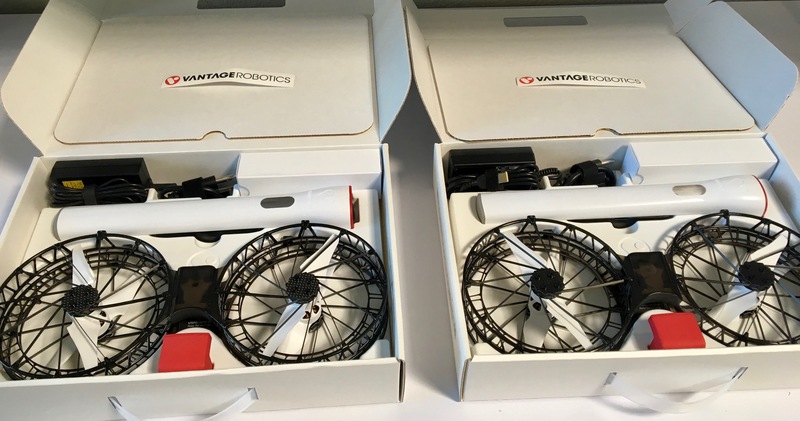 What is does mean for consumer users is you can know Vantage has approached drone safety with more rigor than would ordinarily be expected for a company of our size and perhaps any other company to date. This waiver gives Vantage the opportunity to pioneer new territory for the use of commercial drones near people. 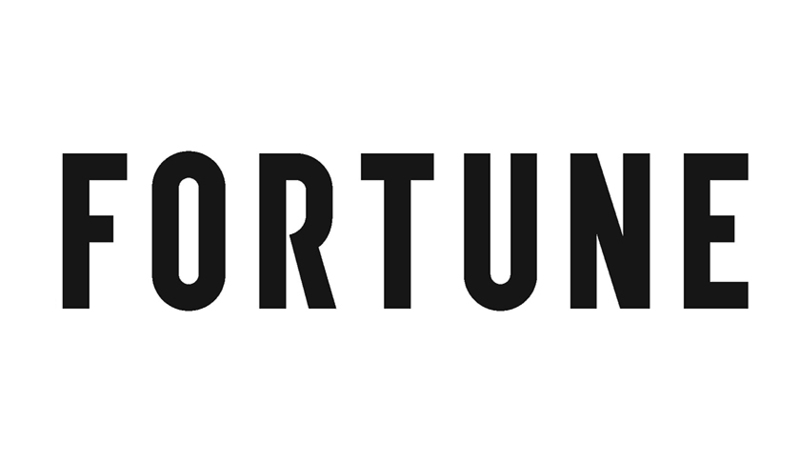 And we are thrilled for the opportunity to be useful for journalism, law enforcement, first responders, security, real estate, events, and a host of other fields where the aerial perspective and remote presence is needed near people. We will continue to filter these commercial customers based on how they can benefit our recreational pilots, who remain our core focus. We also know the history of pioneers isn’t 100% positive. This heightens the responsibility we feel to tread carefully and respectfully as commercial drones enter our personal spaces. We’re continuing to work to not only reduce risk of physical harm, but also address the emotional risks imposed by having crafts overhead, by reducing noise, considering our visual impact, and listening to concerns regarding privacy. As readers, we’d love to hear from you on your hopes, ideas, and concerns for the increasing use of flying robots within the human sphere. As always, your comments are appreciated. PS – To all of our customers awaiting their units, we haven’t forgotten about you! Our team is going full tilt getting units shipped. We will be sharing a shipping update shortly in our next post. Greetings from Vantage HQ! We hope you (in the norther hemisphere) have been having a wonderful summer so far. Life has been incredibly busy here, but we wanted to give you a short update on our latest progress. Positioning: We have further tuned Snap’s GPS location estimation as well as robustness. Snap can now continue to fly safety with multiple sensors failures. Tracking beacon: Speaking of positioning, we are nearly done with an integration of a low-cost off the shelf GPS tracking beacon. 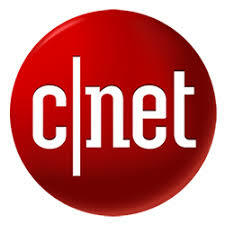 This greatly improves Snap’s tracking accuracy and update rate for tracking shots. We’ll be releasing an app update to support this and sharing some video to show off the improved performance soon. Video quality: We have fixed a bug with the EIS that caused an uneven horizon. This ended up causing a glitch in the yaw, which has also been corrected. We continue to work on tuning the details of EIS performance, as well as auto white balance and sharpness in 1080 mode. Link performance: We have been investing heavily in squeezing every last bit of performance out of the wireless link between your phone and Snap. 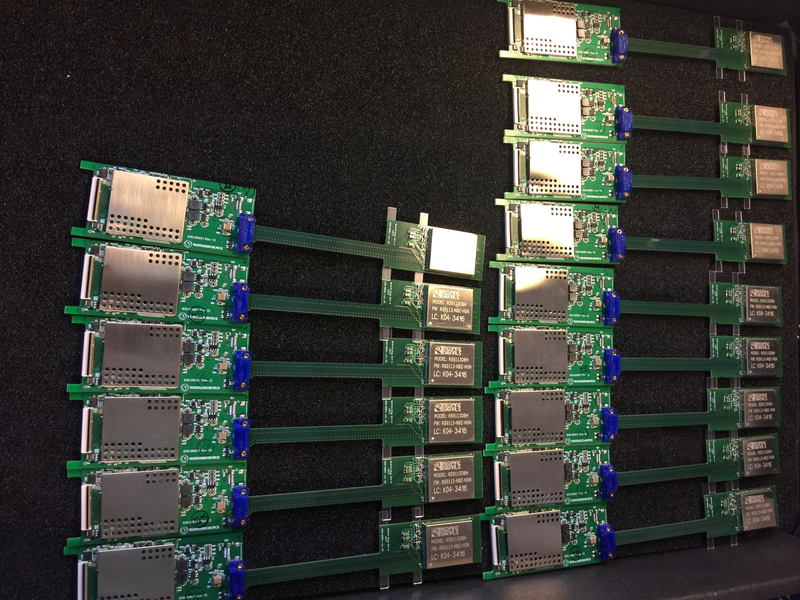 We have been working closely with our WiFi module vendor to modify their onboard firmware, as well as defining our own WiFi compliant communication software which massively improves range, reduces video latency, and improves video stream quality. Flight: We have been tuning our flight controller to improve yaw control in all conditions, make movements consistently smooth, improve takeoff and landing, and improve reliability of detecting being held. Our ground avoidance is smarter than ever, and now adaptive to changing weather conditions. Improved RTH: You can now select whether you want Snap to return back to you or the original takeoff location. We find the latter to be good when taking Snap out kitesurfing and surfing. Android: Our Android Beta is now live and in customer’s hands. We are steadily adding features to bring the Android app up to the same level of functionality as iOS. iOS: We’ve made a large number of tweaks and improvements to the details of the UI and controls. And now it’s iPad compatible as well! Bugs: We continue to find and squash bugs at a superhero pace. Tracking rotor set: We have a very exciting announcement coming regarding our tracking rotor set. This alternative rotor set massively increases flight time, top speed, and wind performance. And it reduces noise, packed volume and deployment time. It does this without compromising on safety or durability. Durability. We continue to refine manufacturing processes to will improve the structural durability of Snap by improving surface preparation techniques, modifying glue application processes, and refining our quality control tests to proactively identify latent issues. Now to the question you have all been asking. Shipping. Our shipping rate has been steadily accelerating, but not at the rate we targeted. This has been slowed by one rather painful hardware bug – an unexpected photonic sensitivity in our barometer, uncovered by a location change. This set us back by two weeks. Additionally, we had a new quality issue with one of our PCBAs that caused the magnetometer to fail after our burn in test. We believe we have this fixed as well. We currently have shipped approximately 10% of the total pre-orders. At our current rate of acceleration, we expect to complete pre-orders by the end of October. Our assembly crew has more than doubled in the last month, and we continue to bring on more. We also are ramping overseas manufacturers now to take on building the more straightforward sub-assemblies. 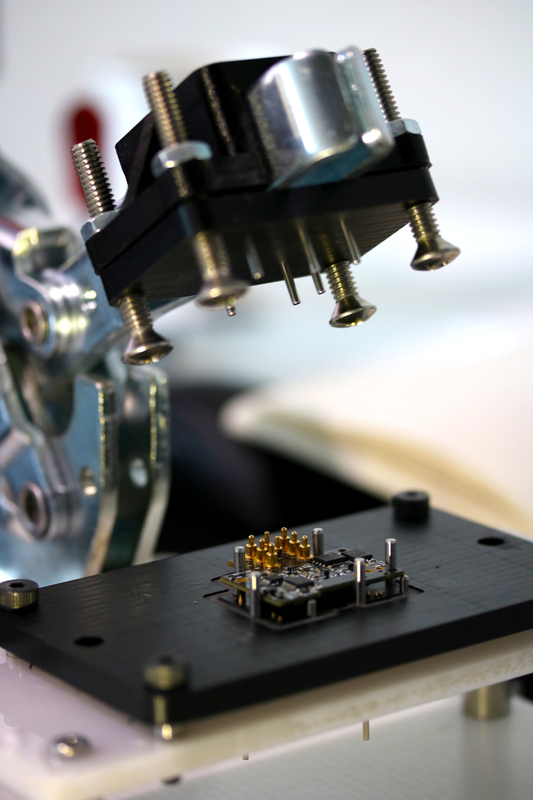 All final assembly and quality tests will remain local so we can ensure complete control over quality. Making drones is really, really, hard. One would think we would have learned this rather thoroughly by now, but we continue to find new and unexpected challenges and marvel at the unexpected complexities. We’ve responded by throwing ourselves even harder back at the challenges and we continue to ship, make improvements, and give more than we’ve ever imagined possible to get Snap in your hands and make sure you will love it. We’ll share the latest with ongoing improvements, new challenges, shipping updates, Android, international shipments, that spare battery, and the case in this post. We continue to improve Snap. Most of our improvements have been in software, but we are also make some exciting hardware improvement as well. We think the shot at the top of this post nicely demonstrates the tracking improvements we’ve been making. This was shot using freeform tracking mode in high wind at 4k 30. We believe we are the only flying camera in the world capable of a shot of this speed, distance, and complexity with this level of quality. We will continue to invest in improving tracking shots to make sure Snap is the best drone in the world for capturing your adventures. We continue to make improvements to the communication architecture and believe we are at state of the art for direct phone control. We recently set a new internal record of a 350 meter Out and Back flight while maintaining a video feed and telemetry for the entire distance. We have also made the necessary changes to our communication architecture to support our range extender, which will enable considerably improved range. We are innovating on milking the absolute most out of WiFi at every level and expect to have a steady stream of exciting news on improvements over the next few months. We’ve been steadily improving Snap’s high wind performance. The shot below was done in 4k 30 mode with no post stabilization. You will notice a little bit of yaw wiggle, but otherwise, Snap had no problem in the 20 mph + winds at this kitesurfing destination. Lastly, we have made some, gulp, hardware changes. We’ve had problems with the header than connects our GPS module to the circuit board breaking during “hard landings”, despite multiple reinforcement iterations. We’ve also seen that Snap did not always maintain a GPS fix when flying through forest or close to large buildings. This led us to test a newly available combined GPS/GLONASS module that is smaller, lighter, has a more robust method for attaching to the PCB, and claimed better location fix robustness. While we were skeptical, as we’ve seen mixed performance from combined modules in the past, we tested it thoroughly and found all of this to be true. Despite the large investment in our previous GPS module, we decided to make the switch so we could be confident that Snap is the best solution on the market. While we were redesigning the tail board for the new GPS module, we also improved the connection technique for the sonar module, which appeared to be vulnerable to the same type of crash damage as our original GPS module. The internal modular architecture of Snap has enabled us to make this changes as inline manufacturing improvements and just required swapping 2 of 13 circuit boards in Snap. We will continue to take advantage of this capability to upgrade Snap as other available hardware improves. We are currently behind our shipping targets and have only shipped about 2% of total orders to date. This rate will accelerate considerably, but we will not be able to make up for time lost. The biggest delay has been a Snap unexpectedly smoking during our manufacturing testing. This required us to stop our line until we figured out why, which took two weeks. We traced the issue to our PCBA manufacturer damaging a capacitor on our motherboard during the depanelization process (when a large sheet of boards gets broken up into individual boards). This capacitor connected battery voltage to ground, and the damage turned it into a resistor/heater, which anyone familiar with Ohm’s law, will know is bad. We have subsequently checked all other boards for damage, changed the depanelization process to prevent future damage, added an additional quality check to detect this damage, and added new battery software protection to detect this failure and shut down when it detects it. 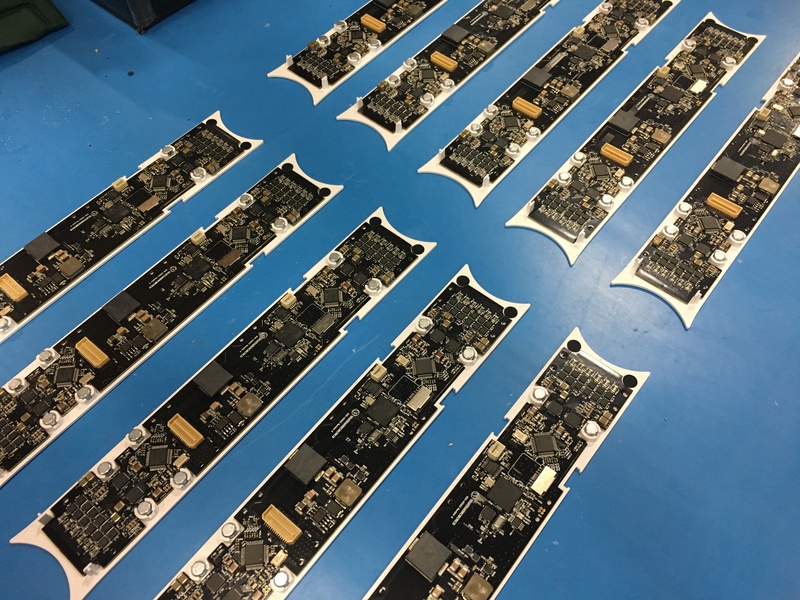 We also had an issue with our image sensor PCB warping slightly during the manufacturing process, which lead to focus issues and low yield on our gimbal assembly. After several iterations on tooling to hold this part flat during the SMT process (when components get soldered onto the circuit board), we now have a solution that appears to be working consistently. We recognize we haven’t been adequately accounting for unexpected delays like this in our estimates and while we are optimistic again that the hardest problems are behind us, it is clear we have mistakenly believed this too many times now and need to pad our estimates more for unexpected issues. Based on this, in addition to the specific delays above, our new expectation is that all pre-orders will be shipped by the end of September. If, we do not encounter any new meaty curve balls, then we expect to significantly beat this estimate. Despite these challenges, we continue to ship units every day and we’ve been grateful for the positive feedback from customers so far. Many of you have asked about unboxing videos – you can see one from a customer below. The MVP (minimum viable product) for our Android app is done. We will be doing final testing and debugging over the next 10 days and then begin shipping to our Android pre-order customers. The initial version will only include manual control mode and then we will successively add Air Tripod tracking, Freeform tracking, Out and Back, Orbit, and Virtual Wire tracking modes over the next month. (The vast majority of the effort goes into setting up the back end of the app, so while only 1/6th of the modes are done, about 95% of the app code is complete.) As there are a large number of different Android devices, it will take some additional time for us to ensure compatibility for all of our customer’s different devices. We will ship only after we have taken steps to ensure compatibility for your specific device, so we while we will prioritize shipments based on order date, customers with less common phones may have to wait a bit longer. If you are an Android customer and interested in being part of our beta program to help test compatibility for your device, please email us at beta@vantagerobotics.com. We will begin international shipments starting next week. For our international customers the reason for delaying shipments internationally wasn’t because we love you any less, just that we wanted to have the most fluid possible communications with any initial customer issues and prefered to avoid adding language and timezone to any debugging challenges. For all of you outside the US, thank you for your patience on this. We are not shipping batteries with initial orders, as we’re currently capacity constrained on battery pack production rates and don’t want to hold up getting full units to customers because of a battery shortage. 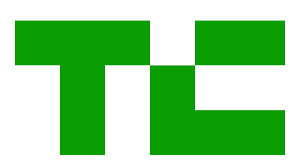 We’re targeting beginning shipping spare batteries by mid-August. Sorry to limit you to 20 minutes per outing in the meantime! If you have a special adventure coming, please let us know and we’ll do our best to make exceptions on spare batteries where possible. We are way behind on the case. We have put this project on hold until we are on top of all of the production challenges with Snap and will resume it as soon as we have the engineering capacity to do so. As of now, we expect to begin shipping the cases in September. In the meantime, we will be shipping everyone a fuselage “sock” to help protect the fuselage in your pack. We have been using this solution for about 1 year now, and frankly prefer it to the hard case, as it is lighter, faster to deploy, and a smaller total packed volume. Either way, our apologies for our delay on the hard case. We’ll close with a recent video that one of our customers (and Beta tester) shared as a comment in a previous blog post. This video does not include any stabilization or color correction in his edit. We look forward to sharing more of your amazing work with Snap in posts to come. We’re continuing to crank units out the door as quickly as we can here at Vantage. We thought you might enjoy seeing how the first round of Snap deliveries arrive. Right now, we’re jamming hard building more assembly jigs to increase throughput, ongoing refinement of quality tests and details on assembly instructions, and working through some inbound quality issues with a few components. We’re going to unreasonable lengths in some cases to make these initial units as perfect as possible, including vapor polishing and hand polishing of some components where we’ve been getting inconsistent surface finishes from our molder. We still battle delays from some vendors, but thankfully have been able to find second sources as needed when a vendor has fallen short. Everything is on track, although it continues to take about twice as much effort as we would have hoped! We also continue to invest in improving software, adding capabilities, and fixing bugs as we find them. We are very close to being ready to release a major overhaul to our communications stack that reduces latency and reconnect time in the event of a signal drop, improves the quality of the streamed video, as well as improves range. We’ve also added a new flight mode – the tracking orbit shot. You can see some sample video of this below. Thank you as always for all the support. 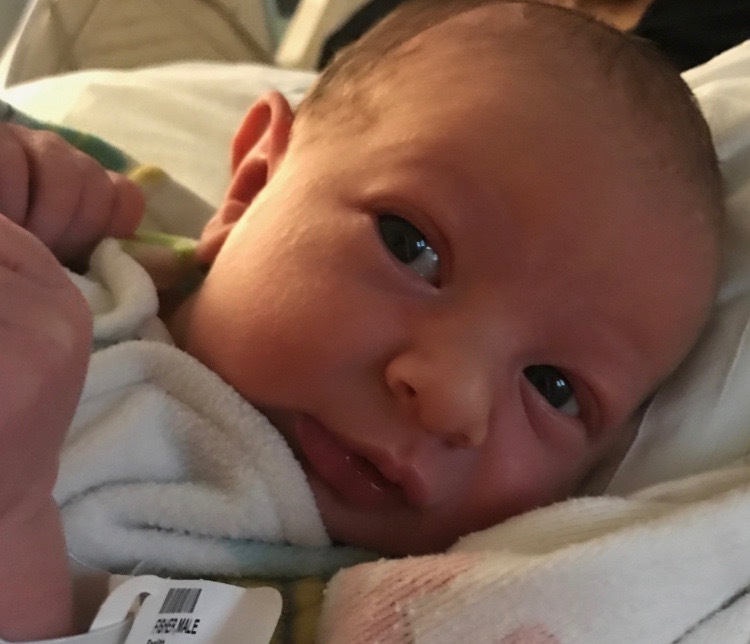 PS – On a personal note, my wife and I had another exciting milestone, with the birth of our son, Alden Joseph Fisher. Between Snap shipping and a new addition to the family, it’s definitely been a full month! The wait has been long, but the day has finally come. 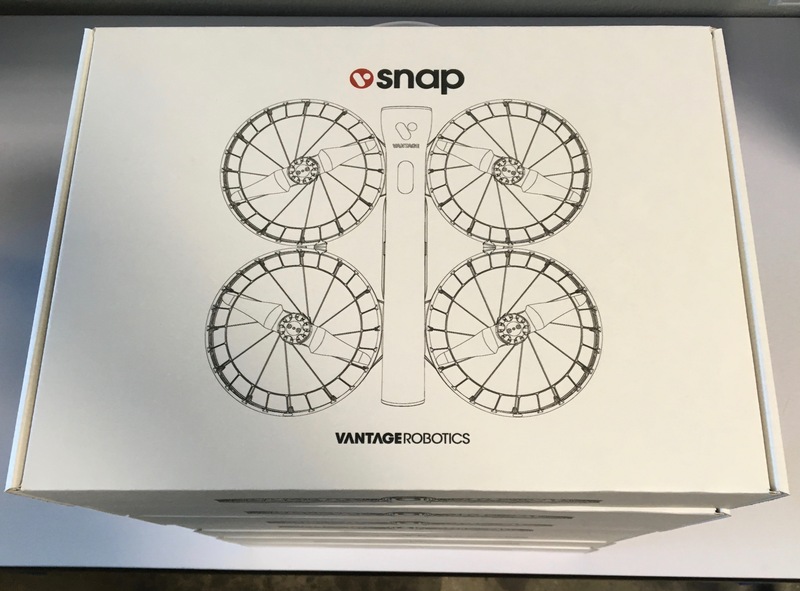 Vantage is now shipping Snaps to our pre-order customers. Thank you to everyone for sticking with us as we worked through the many challenges of creating a product as revolutionary as Snap. The iOS app, Fly Snap, is currently available on the App Store. The Android app still needs a few more weeks of test and debug and will be released thereafter. Our initial production rates are limited, but we are ramping up quickly, with the goal of shipping all pre-order units by the beginning of August. We will continue accepting pre-orders until June 25th and then stop taking new orders until our e-commerce site is live. We won’t be satisfied until every one of you has a Snap AND loves it! We look forward to hearing your feedback. A similar red-tailed hawk actually snatched Snap out of the sky a few weeks ago. Presumably she is showing a bit more respect now that she knows it is a production unit, instead of a beta prototype. In all seriousness, this has been an extremely exciting and challenging year for all of us at Vantage, as we’ve worked through roadblocks harder than we ever imagined. Your support and confidence has meant the world to us. Snap could not have happened without you. We expect to have units ready for shipping today, but made the decision to hang onto them for the weekend to give adequate time for more rigorous burn-in testing. Unfortunately, we’re getting critical PCBs right now that we hoped to have much earlier. We just made the tough call that we don’t feel comfortable rushing finished units out the door in the next three hours, as much as the entire team is as eager to start shipping as you are for us to do so. If you’ve been reading the comments closely from our last post, you might have noticed that I took Scott on in a friendly wager on whether we’d ship today or not. You win Scott. Please let me know how I can get you that $5. (Or I’d be happy to include it with your unit if you prefer.) Regarding your comment that you thought we wouldn’t ship until this fall, I’ll happily go double or nothing on that one if you’d like. We’ll be burning the midnight oil through the weekend to make this happen (and maybe win my $5 back). We are really really close! We continue to work around the clock at Vantage to get you your Snaps and continue to battle new challenges. Our contract manufacturer (“CM”) has had one SMT line down (the tool that puts the components on the circuit board of your Snap), which has delayed the completion of some of our boards. Our CM tells us that all boards will be complete on May 30th at the latest, which pushes out the first shipments to June 9th. 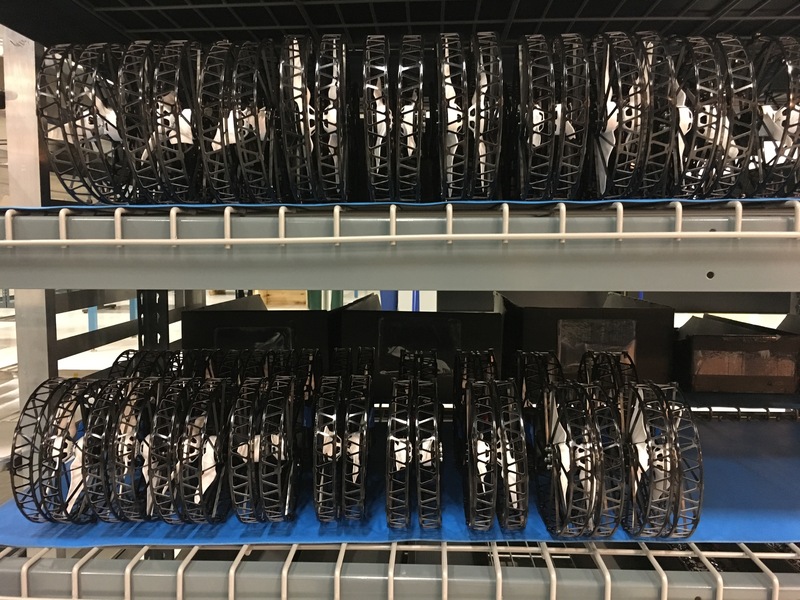 We are building up subassemblies as we wait for the final assembled circuit boards, so we can minimize lost time in our overall production schedule from this delay. We’re steadily improving the reliability of our video and control data stream and the speed of reconnect on signal drops. We’re currently adding a number of fancy tricks to combine data packets, measure and adapt to latency issues in real time, and eek every last drop of performance we can out of our data link. We’ve added exponential control for both the app controls and the bluetooth two stick controller (we’re overdue on sharing more on both of these!). Exponential control makes it possible to have very fine grained control for subtle slow movements without limiting top end speed. Gimbal pitch control wasn’t as smooth as we wanted. We changed design of the communication link to send rotation rates instead of target angles and added exponential control to the app interface so now Snap does buttery smooth gimbal pitch angle adjustments. The Return To Home now varies behavior to match the circumstance, so Snap returns home slowly at lower altitude from close distances and more quickly at higher altitude when further away. We find this strikes a better balance of avoiding distant obstacles and keeping the experience mellow when Snap is close. We’re working on improving the image sharpness in 1080p mode, which currently is not quite to spec. Snap occasionally didn’t stay in place perfectly during both hand and ground takeoffs. We’ve found the bug and fixed it. We’re keeping busy steadily improving every aspect of Snap as we wait for these final components to be assembled. Safety: Imagine if your SLR camera said, “DANGER: DO NOT USE NEAR PEOPLE!” Think about how that would limit your photo albums. There is not a single high performance flying camera available today that can be used responsibly near people. This massively limits the range of places that you can fly your open bladed models, the type of shots you can get, and the amount that you will end up flying. Snap is the only high performance flying camera in the world designed to make you and everyone around feel at ease and safe. Ease of Use: We’ve designed Snap to be the easiest to use high performance flying camera in the world. Snap’s interface enables you to set up shots based on high level goals and let software do the work instead of relying primarily on complex two stick controllers (although you can do that with Snap too!). Snap has more options for tracking shots and easier interfaces for beautiful pre-planned shots than anything else available. 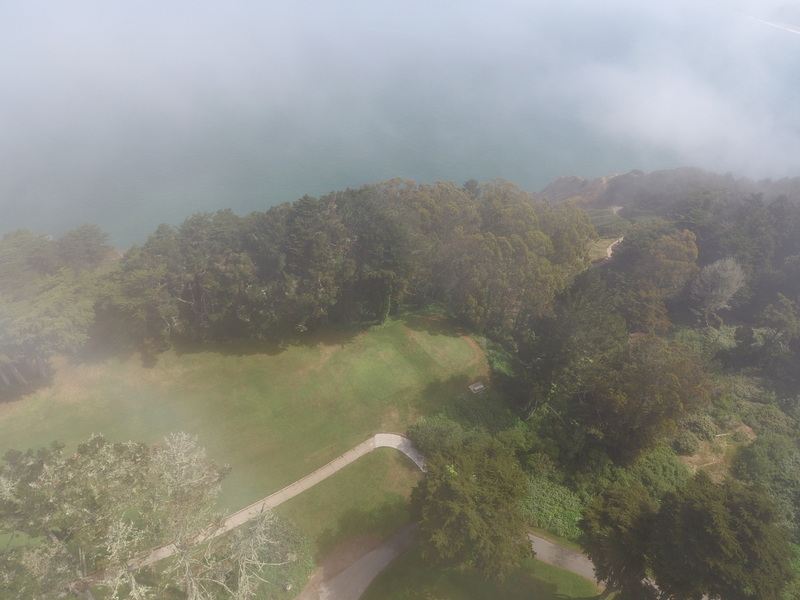 These automated shots are only really possible with a safe flying camera, as letting software take control is massively irresponsible in most settings with drones that don’t consider safety. Extensibility: Snap is the only flying camera that allows you to extend capabilities over time. We are developing rotor sets specifically designed for amazing tracking shots, silent operation, 1-hour flight times, and a range of other super-powers that let you extend what you can do with your Snap. Portability: Our friends in China are giving us a good run for our money here, but Snap remains the only high performance flying camera that you can take and use anywhere. The ability to take Snap with us all the time and use it as inspiration strikes continues to change how we see the world and light our creative fire. Of course, what excites us most, is seeing what you will do with these capabilities. And that is very very close for both you and us. If you are in the first batch of orders, you will be receiving an email from us this week to confirm your address and other important details. We’ll keep you in the loop as we work through these final steps. Thank you as always for sticking with us through this journey.